Winter touring holidays or breaks appeal to so many motorhomers for a number of reasons. The roads are not so crowded, parking restrictions may not be so severe, wildcamping is tolerated more as many campsites are closed and crisp, winter mornings offer some of the best scenery. 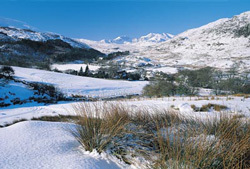 The Lake District provides the perfect backdrop for a winter motorhoming trip. There are many walks you can enjoy whatever the length of your stay, but always ensure you’re well prepared and have the right equipment to hand. Research the walks beforehand and only tackle those you are confident of completing. Some regular Lakeland walkers will tell you that the National Park offers a much more handsome landscape in the winter months than it does in the summer. Why not find out for yourselves? Snowdonia, known in Welsh as Eryri, offers something for everyone wanting to breathe in some fresh mountain air including forest walks, birdwatching, castles, museums, …the list is endless. There’s also a steam railway so you can take a seat and admire the crisp winter scenes from the comfort of your carriage. The Hebrides – or the Western Isles as they are also known – is a chain of beautifully unspoilt islands 30 miles off the North West coast of Scotland. They are a popular destination with serious motorhomers over the winter months, partly because the weather is generally mild due to a year-round current that originates in the Caribbean and also because they are easily accessible from mainland Scotland by ferry. Although the winters are mild, visitors occasionally experience some of the wildest and stormiest gales around – so take your raincoat in preparation! Stay at: Sites are few and far between and don’t expect many facilities on what sites there are. Try Cnip Village Grazing Trudst Campsite, Cnip, Uig, Isle of Lewis. Tel 01851 672265. Alternatively, wild camping opportunities abound. County Cork’s coastline offers visitors the chance to spot dolphins and porpoises all year round while the whale-watching season runs from June to January. The area is also famed for its excellent local produce and boasts a wealth of decent restaurants, particularly in the medieval town of Kinsale. So if it’s shopping, a brisk walk along the beach or a pint of Guinness in one of the area’s many bars, County Cork offers it all. And head for Blarney Castle, the home of the Stone of Eloquence. Kissing the Blarney Stone is a right of passage for all who visit the County of Cork. Stay at: Jasmine Villa Caravan Park, Carrigtwohill, County Cork. Tel: 00 353 21 4883234. Don’t forget to make sure you have valid motorhome insurance before setting off out in your motorhome this winter. Our caravan site is open all year and we have people visit right through the winter.